After an early start, our first stop was a petrol station to quench the raging thirst of our four wheeled brute. So after visiting most of the pumps the forecourt had to offer and sticking my credit card into various parts of the apparatus it was never meant to go, I finally figured out how they worked, and not more than one hour after beginning the endeavor, we were off. Straight to Quillan, which was a nice enough town set next to a river, where we stopped for an insipid coffee and a rather decent pain au chocolat. But we were soon on our way again as today we would be exploring some of the finest castles this area has to offer, and they do a very nice line in castles around here. After a drive of an hour or so, we entered the part of the Cathar region that is home to the most magnificent chateux, or ruins thereof, than any other region. Although to call them Cathar castles is somewhat of a misnomer as the Cathar Church never built anything, these castles were already standing by the time the Cathars came to prominence, they either took them over or had the use of them from owners sympathetic to their cause. Actually even this is inaccurate, despite what the tourist information says, most of the castles, save a few, were built after the Cathar Crusade to defend against the Spanish, albeit on the same sites that were home to the ‘original’ Cathar Castles. There are indeed some of those castles still remaining from the thirteenth century that witnessed those chaotic times, but they are small crumbling ruins, well off the tourist trail, and for the most part completely unheard of. Once the border was relocated to the Pyrenees in the seventeenth century, these strongholds were left to decay, leaving behind the magnificent ruins that hold sway on imaginations today. So even though they don’t really have the mystery and romanticism of that Cathar period, they are still amazingly affecting structures in their own right, and it’s not too difficult, once within their crumbling walls, to be transported back to different time. The first castle we stopped at, or more accurately stopped under, was Chateau de Puilaurens, we parked up in the tiny village of Puilaren, next to an ancient church and under a cobalt blue sky, to get a view of the castle as it soared upwards from its elevated roost, 700 metres above us, with only the bustle of busy insects accompanying the clunking of our cameras, it was a serene and tranquil place to be. Apart from the occasional outburst from me as another minor piece of my apparatus decided to fall apart or generally make a bloody nuisance of itself. But I am nothing if not tolerant and uncomplaining of such things, so I soldiered on regardless. We then drove through one of the many scenic gorges that cross the Aude department to reach Chateau de Quéribus, which, owing to its elevation, can be seen miles before you arrive, its remaining tower rising up from the rocks on which it stands, almost as if it had been fashioned by the same ceaseless elements that cleaved the immense landscape it watches over, rather than by the mere hands of men. So, feeling suitably dramatic, we drove the picturesque road up to the castle entrance, where we had a spot of lunch and watched the aphotic horizon fill with a boiling maelstrom of cloud, thundering towards us like an apocalyptic nebula, spewing terror and bedlam before it. These were my thoughts as, wide eyed, I woefully gnawed upon my stale sandwich, at which point Sarah casually mentioned that it looked like it might drizzle a bit, and I realised I may have been letting the surroundings get to me slightly. So we grabbed our cameras, paid the entrance fee and made our way up the steep path to the castle above us. Needless to say, the views were stunning and wandering round what’s left of the castle was fascinating. Each ‘room’ had a brief description of what it was used for and any notable features it housed, and with its winding steps and endless levels to explore, before we knew it, an hour had already passed and we hadn’t even made it to the top yet. By the time we got there and looked down upon the mystical remains of the castle and the rutted, titanic landscape beyond, as so many had done before, the sun was beginning to give way to the foreboding gloom brought upon us by the pandemonium encircling above, like a terrifying… Well anyway, looked like rain was on the cards, so we started to make our way back down, as we wanted to get to our next port of call before the winds started to blow, as they had a habit of closing it if that happened. But all thoughts of blowing wind, so to speak, were cast from our mind when we drove into the village of Cucugnan, that sits at the base of the castle, took a few snaps and saw a coffee shop open, obviously we felt compelled to alight and make use of it, and we were glad we did, as it was a damn fine cup of coffee and well worth the visit. Scampering back to the car we hightailed it to Chateau de Peyrepertuse, some say the jewel in the Cathar crown, assuming that crown is made of castles. Its name, in Occitan, literally means pierced rock and the way it looks as if it has burst from the mountain peak is quite stunning. After motoring up the incredibly scenic and hairpin lined road, we hopped out the car, paid our way and bounded up the path to one of the largest castle compounds in the region. The site is split into half, the upper and lower castles and it is the pathway that links the two which causes the site to be closed during periods of strong wind, although I have to say I didn’t feel particularly vulnerable whilst traversing the route even though it was fairly gusty, might be different if it was blowing a gale I imagine. 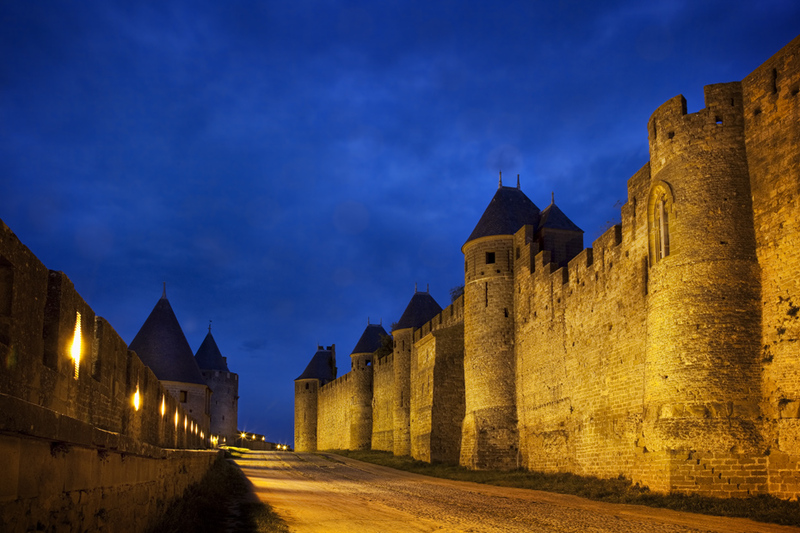 It is one of the ‘Five Sons of Carcassonne’, the others being Queribus, Termes, Aguilar and Puilaurens, five castles strategically placed to defend the border, before it was relocated south under the Treaty of the Pyrenees, which rendered these fortresses redundant and allowed them to achieve such graceful disintegration. Although having said that, they have all been restored, to a greater or lesser extent since the 1950’s, otherwise we wouldn’t have been able to visit them in the first place. After a good couple of hours of scooting around the comely remnants we headed back down, to the village of Duilhac, which was an attractive little place to wander around for half an hour, before getting back in the car and heading for a piece of road I’d rather been looking forward to getting under my wheels – the Gorge de Galamus, a spectacular gorge created by the Agly or ‘river of eagles’ that has, over the millennia’s, cut a huge crevice in the limestone rocks, and those lovely French people were kind enough to build a road in it, right on the side of the cliff face. It also has the added advantage of being home to Ermitage St Antoine-de-Galamus, a small chapel built right into the cliff which utilises the caves the rock contains, caves which were probably called home by our early ancestors, as its atmospheric nave. Needless to say my camera was champing at the bit. As we drove through the entrance of the gorge the sign posts made it quite clear that this was a small road with lots of overhanging ledges etc and nowhere to turn round and should not, in any circumstances be attempted in anything as big as, say, a camper van, this was definitely not the way to go if you were driving something like, say, a camper van. This was made clear by the big red signs which were placed at eye level as you drove in that showed a vehicle that, closely resembled, say, a camper van, and had a big red cross through it. So we set off round the twisty road with fabulous views above and below us, especially below, it was slow going but that didn’t matter as there was so much to see. As we negotiated a particularly tight corner under a low hanging outcrop of rock I remember thinking, I’m glad I’m not driving something like, say, a camper van. We then rounded the next bend and I thought my eyes were deceiving me, there just up ahead, was something that looked not just similar to, say, a camper van, but was in actual fact an actual camper van actually coming the other way. Well I was somewhat surprised and wondered why the signs had lied to me about bringing camper vans along this route, it was obviously, eminently possible. Luckily we had just come past the only wide section of road we’d seen, so I reversed back, and tucked into a corner so they could get through, then we waited, and after a while, when I began to take more notice of them, I could see those signs hadn’t been lying to me after all. Every foot that van travelled had to be scrutinised by spotters to stop it ripping off the roof or doors, it would seem they were in a mighty pickle. There was no way to turn around, they couldn’t reverse, especially with the tail of cars behind them and going forward was looking more and more out of the question. I can only assume the road coming the other way was slightly more forgiving, otherwise they wouldn’t have made it this far, but it was getting narrower. We waited a while to see if they would make much progress, as we really wanted to do this drive, but despite the occupants of all the impeded cars standing around with their arms crossed and offering advice, they weren’t getting very far, very fast. In the end we decided to turn around, again counting our blessings we had the room to do so, and head back another way, which was not ideal. Whether they ever got out I’ll never know, I’m inclined to think they are still there, negotiating the road inch by inch, perhaps becoming a tourist attraction in themselves. But, thanks to the power of You Tube, you can have a short trip along the Gorge de Galamus and a visit to the Ermitage St Antoine-de-Galamus, which is more then we did. But, as they say, every cloud has a silver lining, and on the way back we happened to pass by Rennes les Bains, a spa town that has both hot and cold natural springs and sits on the banks of a naturally salty inland river, which is unusual. As you can imagine it’s pretty popular, especially with the older generation. We had a wander around and took a few pictures of its scenic dwellings before heading to Carcassonne for a few night pictures and some good old fashioned troughing.